YOU ALSO MUST BE PREPARED! This Sunday's readings focus on perseverance in faith and preparedness. Our first reading from the Book of Wisdom (18:6-9) highlights the Israelites preparedness and faith in God's promise as they awaited the first Passover. "The night of the passover was known beforehand to our fathers, that, with sure knowledge of the oaths in which they put their faith, they might have courage. Your people awaited the salvation of the just and the destruction of their foes. For when you punished our adversaries, in this you glorified us whom you had summoned. For in secret the holy children of the good were offering sacrifice and putting into effect with one accord the divine institution." In our Gospel reading (Luke 12:32-48), Jesus admonishes his disciples to be prepared always, for they know not the hour that the Son of Man will come. 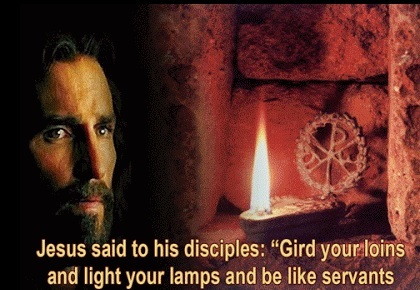 "Jesus said to his disciples: 'Gird your loins and light your lamps and be like servants who await their master's return from a wedding, ready to open immediately when he comes and knocks. Blessed are those servants whom the master finds vigilant on his arrival. Amen, I say to you, he will gird himself, have the servants recline at table, and proceed to wait on them. And should he come in the second or third watch and find them prepared in this way, blessed are those servants. Be sure of this: if the master of the house had known the hour when the thief was coming, he would not have let his house be broken into. You also must be prepared, for at an hour you do not expect, the Son of Man will come.'" In our Epistle reading from the Letter to the Hebrews (11:1-2, 8-12), the author teaches the meaning of faith and uses the story of Abraham, Isaac and Jacob to illustrate the model of faithful perseverance. "Brothers and sisters: Faith is the realization of what is hoped for and evidence of things not seen. Because of it the ancients were well attested. By faith Abraham obeyed when he was called to go out to a place that he was to receive as an inheritance; he went out, not knowing where he was to go. By faith he sojourned in the promised land as in a foreign country, dwelling in tents with Isaac and Jacob, heirs of the same promise; for he was looking forward to the city with foundations, whose architect and maker is God. By faith he received power to generate, even though he was past the normal age -and Sarah herself was sterile - for he thought that the one who had made the promise was trustworthy. So it was that there came forth from one man, himself as good as dead, descendants as numerous as the stars in the sky and as countless as the sands on the seashore." The Scouts have a motto, "Be Prepared". It is a good motto for Christians as well, for we do not know when the master will come calling. May he find us watchful and ready.